Gibby....brunettes. You know the rest. The rivalry between Michigan and Michigan State could be a great one. But it isn't. And it has nothing to do with Michigan. It could be the greatest in-state rivalry in the nation. There are many other great ones out there. Texas-Texas A&M, Florida-Florida State, USC-UCLA, Oklahoma-Oklahoma State, Oregon-Oregon State, Iowa-Iowa State, Purdue-Indiana, Alabama-Auburn, etc. But Michigan-Michigan State, I don't think, makes that list. It could be because the series has been dominated, historically, by the Maize & Blue. It could also be because Michigan has higher profile rivalries with Ohio State and Notre Dame (for now). Sparty fans have felt like second-class citizens in the state of Michigan for generations, and the numbers back that up. So when Mark Dantonio came along and made no mystery that he hates Michigan with a passion, and then started obnoxiously beating us when we were at our most beatable in decades, it ignited the inner-hate that all Sparty's feel towards the Maize & Blue. That sign currently hangs in the Michigan State locker room [HT: Spartan Nation]. Is it just me, or is that NOT AT ALL bulletin board material? Is is also just me, or does Michigan State seem to try so hard to stir the pot when it comes to everything Michigan does? Mark Dantonio has gone out of his way, time and time again, to convince us he's not a fan of Michigan or anything related to Ann Arbor. We get it. You hate us. You hate us more than you love Michigan State. Here's a nickel's worth of free advice – Make it more about the greatness of Michigan State, and less about how disrespected you feel. No one is going to feel sorry for you. Both quotes are very tame. But if that's all it takes to peg the meter in East Lansing, I think it speaks to a dumber issue here – one that is holding this rivalry back. Because it's not so much about the actual football being played that is so important here, it's the juvenile bitterness that surrounds the game – centered almost entirely in the small space above Mark Dantonio's shoulders. That's always the story when this game rolls around every year. What Michigan-hating, MSU-disrespecting nonsense is Dantonio going to spout this season? UPDATE: Here's this one, too. At this rate, this post may end up on a wall in the Sparty locker room! Much has been made recently about a possible night game between these two schools. With Notre Dame, Michigan's only night game opponent so far, exiting the rivalry, Dave Brandon needs more viable options for night games at the Big House. But Brandon, always diplomatic, is not interested in a UM-MSU night game in Ann Arbor. "We don't think think it's a good idea," Brandon said. "From our perspective, the nature of that rivalry and the intensity of it, when you put that on in prime time and you give everybody all day long to gear up for it. "Hosting that at Michigan Stadium, that's probably taking that a step further than it needs to go." It's not worth it. Even with what would be added to the game by having it at night...bigger network TV audience, elevating the status of the rivalry, added revenue for area businesses, etc...it's still not worth it. It's not worth having the Milwaukee's Best-chugging, couch-burning fans from East Lansing in town for one minute longer than they have to be. Not surprisingly, MSU AD Mark Hollis feels differently. ..."from our perspective, night games add a new dimension. ... We've had very good success here with Notre Dame and Boise (State) in the past (at night)." As someone who grew up just over the border in Toledo, I never really understood the nature of the Michigan-Michigan State rivalry. I didn't realize how intense it was. But since living in this state for going on 9 years now, I can see that the intensity glows much brighter from East Lansing than it does from Ann Arbor. Which is why not many folks from outside the state really understand how big this game is. The rivalry is being held back by this one-sided hatred. MSU fans hate the label "Little Brother" that Mike Hart applied back in 2007, and I get it, it was probably an inappropriate thing to say. But they've let that comment dictate their bitterness, despite their recent success in the series. This rivalry could be one of the best in the country, but it's not. And it won't be until it becomes less about Mike Hart and especially Mark Dantonio and more about the game itself and what is happening on the field. What do you think? 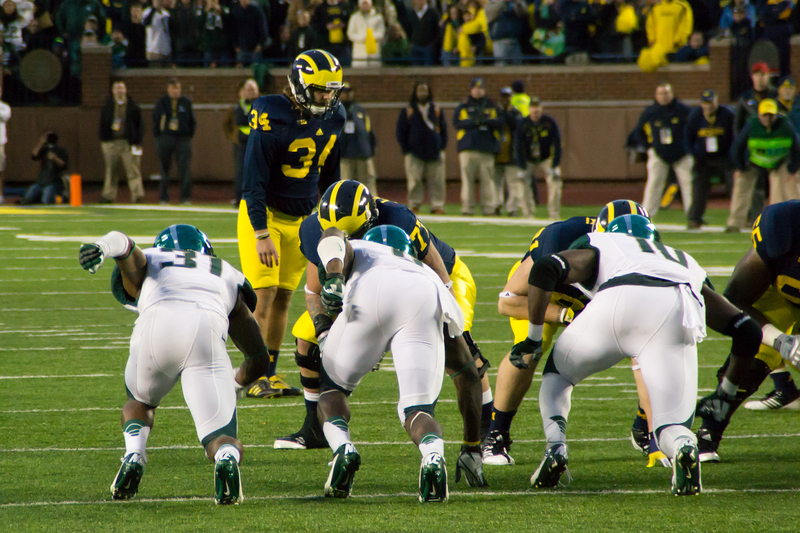 Should Michigan State and Michigan play at night? Follow this discussion on our message board. If they want a night game so bad, let's play it at 3am after all the couch-burners pass out in their front yard.